We’ve looked at muting (part 1), picking patterns (part 2), and scale and harmonic choices and now we will to look at the rhythmic ideas used in modern metal. 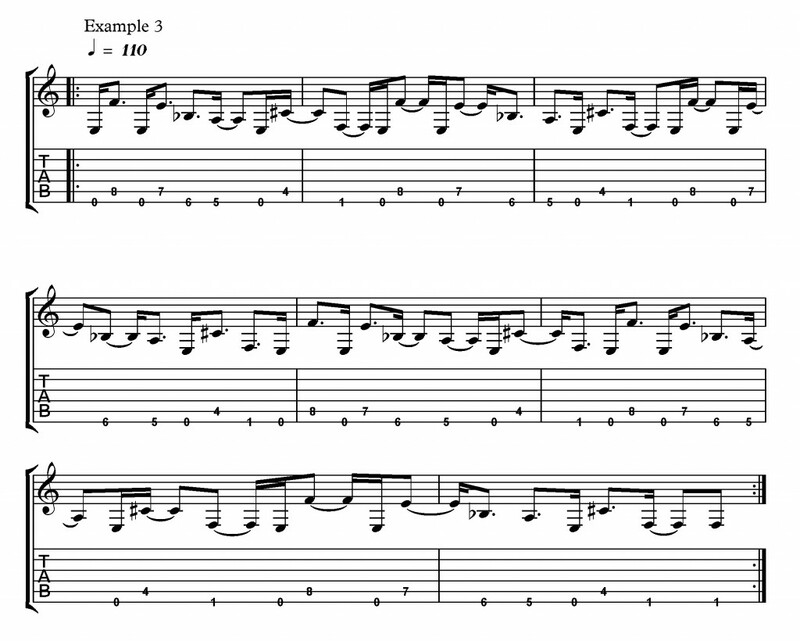 Cross rhythm, also known as rhythmic displacement, is now quite a common feature of metal rhythm parts in the modern metal subgenre affectionately known as djent. The word polyrhythm is often misused to describe music that is cross-rhythmic. The subtle difference between the two is to do with subdivision of the beat. A polyrhythm would take a certain space of time, for example four quarter notes , and overlay six quarter note triplets in that time. Cross rhythms would play within the basic subdivisions of the bar but play a phrase of different length, so that with repetition the two ideas would phase against each other. Frank Zappa’s music features polyrhythm heavily, he employed irregular tuplets within a common time signature, such as can be found in the ‘Black Page No. 2’. This is a massive subject in itself and we will not broach it today, as it is not commonly used by modern metal bands. Cross rhythms will always feature a time signature and phrase length of differing values which work against each other as they repeat and can described in terms of ‘x across x’. The most crucial element to mastering this cross rhythm technique, and employing it convincingly in a real musical setting, is to have a secure awareness of the main pulse of the piece. This will come with time, and listening carefully as you play. Make an effort to tap your foot or nod your head in time with the metronome while playing these examples. When listening to the bands listed below, listen out for the use of the snare drum and usually a china cymbal in the modern metal djent style which outlines the basic pulse of the song against which the cross rhythm is operating. After a while you will learn to feel how each repetition of the phrase sounds as it’s starting point changes in relation to the pulse, but this be sped up by working out whether the phrase will start on the beat, off the beat or on a up beat sixteenth note. The first example is very straightforward as it is just repeated open E power chords, but to speed up the process of learning more advanced examples it is worth carefully analysing. Notice how the second chord is on 1 e & A, the third on 2 &, and the fourth on 3 e. The pattern then repeats with the next chord on the beat of beat 4. Therefore we can see that a cross rhythm displacement of three 1/16 notes (a dotted 1/8 note) will ‘resolve’ (i.e. line up again with the beat) after three beats, and line up with the start of the bar after three full bars of 4/4. This idea is more in the style of Planet X or Dream Theater than Meshuggah and the current modern metal trend, but is a great riff style nevertheless. We feature a repeating pattern of five 1/16 notes that cycle over the 4/4. Notice how the pattern is modified at the end to fit into a two bar loop. Patterns that have no rests involved are much easier to play, but to get the full benefit from the example, try to accent the first note of every five and really feel the two metres moving against each other. Finally we have quite a challenging rhythmical idea. This riff is in the style of Meshuggah and features a long 1/16th note based cross rhythm (21/16) across a 4/4 feel. The riff repeats five times before being modified on it’s sixth repetition to fit the four bars of 4/4 context. When learning this type of idea, I would learn the riff in isolation, treating it as an odd time signature on it’s own. This will help to get its sound in your head. Next, break down the riff into smaller chunks and see if it is obviously composed of smaller 2, 3, 4, 5 semi quaver length rhythmic cells. Finally, repeated listens to drill the sound of it into your head. To be authentic I should have recorded this on my 7 string or even an 8 string guitar, both of which are now common in modern metal. However so that the concept is accessible to all I recorded it at E standard on a six string. If you’re experimenting with composing your own cross-rhythmic riffs, then you may like to employ a sequencer so you can hear the two parts work together if you’re having trouble playing it straight away. One of the first bands to consciously employ these ideas in a rock context was King Crimson (Discipline, 1981), perhaps influenced by minimalist classical music of Steve Reich and Terry Riley. Meshuggah pioneered the use of cross-rhythmic riffs in metal since the mid 90’s and their impact on modern metal cannot be understated. Their blueprint has been to combine a 4/4 rock beat with a phasing rhythmic guitar pattern which resolves within an eight bar section of 4/4. Their influence can be heard in many bands which have developed this idea and incorporated it into their own songwriting. Listen to Tesseract, Monuments and Periphery for great examples. This is a short article on a VERY broad subject so please ask any questions you may have in the comments section below.